Johannes U. Hoeber, arrived in the United States on December 22, 1938 at the age of 35. Just nine months later, he published his first article on American reform politics in the National Municipal Review, a professional journal of public administration. How did he accomplish that so quickly? Johannes was had intelligence, energy, and a good education (Ph.D. from Heidelberg) as well as a good knowledge of English acquired during a year at the London School of Economics. And he worked hard. And he was lucky. Within a few weeks after his arrival, Johannes landed a position as a researcher/writer for the Philadelphia City Charter Committee. The city had been under the thumb of a corrupt Republican Party machine for 60 years, and reformers believed a new Charter was the best way to revitalize municipal administration. Although an independent commission had drafted a new Charter that would allow the city to modernize its government, approval of the State legislature was needed before Philadelphians were allowed to vote on it. The City Charter Committee Johannes worked for led the fight for the adoption of the Charter. As has often happened, however, the Republican legislature in Harrisburg blocked Philadelphians’ attempts at reform and good government. The new Charter would have outlawed the old political patronage system, under which every city employee paid 10% of his salary to the Republican Party. It was no surprise, then, that the Party wouldn’t let the Charter come to a vote. Undaunted, Johannes — new immigrant that he was — wrote an analysis of the Charter, the benefits it would have brought to his adopted city and the rotten politics that killed it. 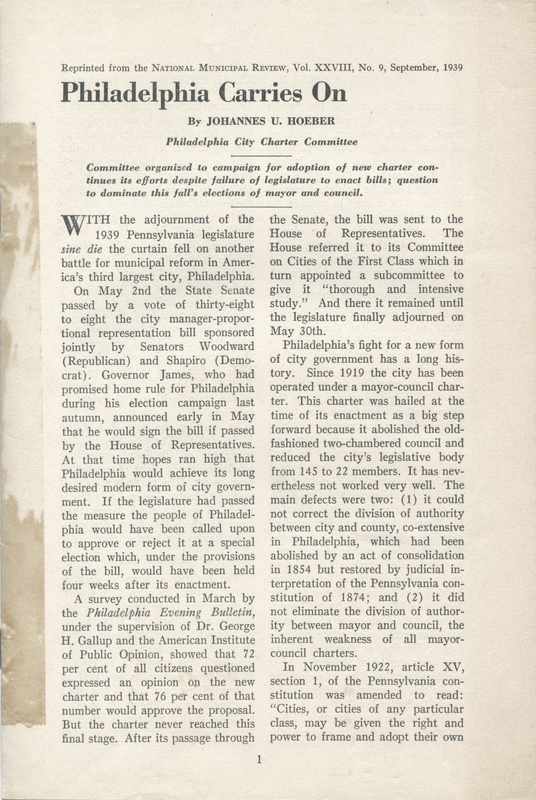 “With the adjournment of the 1939 Pennsylvania legislature, ” he wrote, “the curtain fell on another battle for municipal reform in America’s third largest city, Philadelphia.” In a section of his article captioned “City Services Poor,” Johannes wrote, “It might be understandable … that a city of the size and economic resources of Philadelphia incurred [a huge] amount of debt if as a result its citizens had received exceptionally good municipal services. But at present some of these services are below the standards reached in other cities. ” At the time, this was an understatement: trash was still being collected by horse-drawn wagons as it had been in the nineteenth century. Pretty fluent writing for someone less than a year off the boat. The editors of the National Municipal Review seemed to agree.